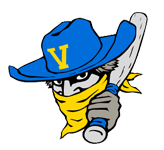 Colin Forgey collected three hits, helping the Alpine Cowboys (35-21) to a 3-2 victory over the Las Cruces Vaqueros (15-41) on Thursday at Apodoca Park. Pat Lemmo pitched seven innings and allowed two earned runs, six hits and three walks while striking out four. Steven Johnson recorded his eighth win of the year for the Alpine Cowboys. He struck out one, walked none and surrendered one hit. Kyle Cross was charged with his eighth loss of the year. He lasted just two innings, walked two, struck out one, and allowed one run.